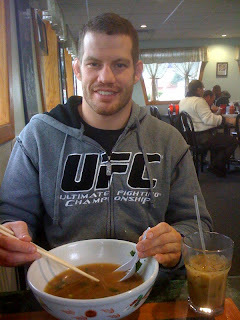 I just had lunch with my wife at a Vietnamese restaraunt in Denver. Pho (pronounced f-uh) is a broth soup dish with rice noodles, spices, herbs and meat. I get "tai" or rare beef. It's excellent with the housin sauce, lime juice, and shiracha hot sauce. If you don't like soup, get the bun (pronounced b-own). I love food!